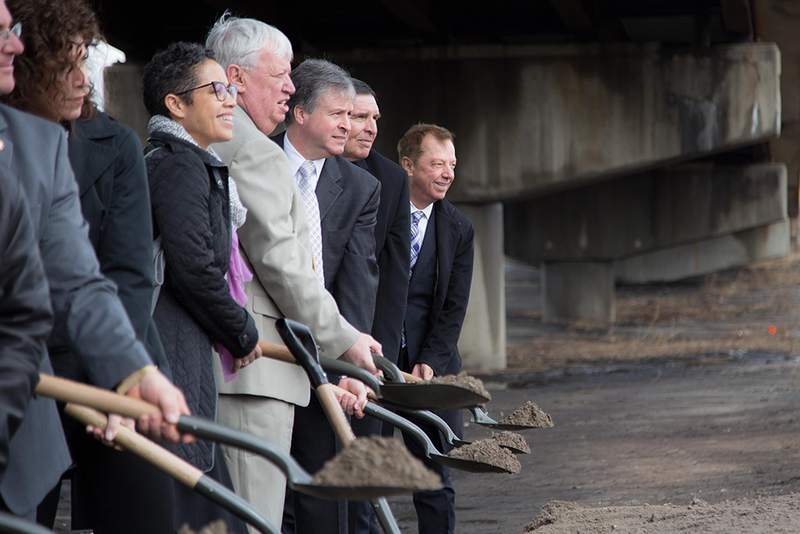 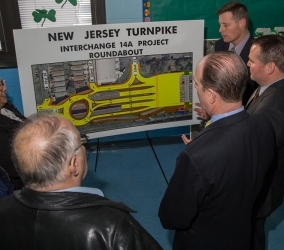 NJTA Interchange 14A Improvement Project | Welcome To Stokes Creative Group, Inc. 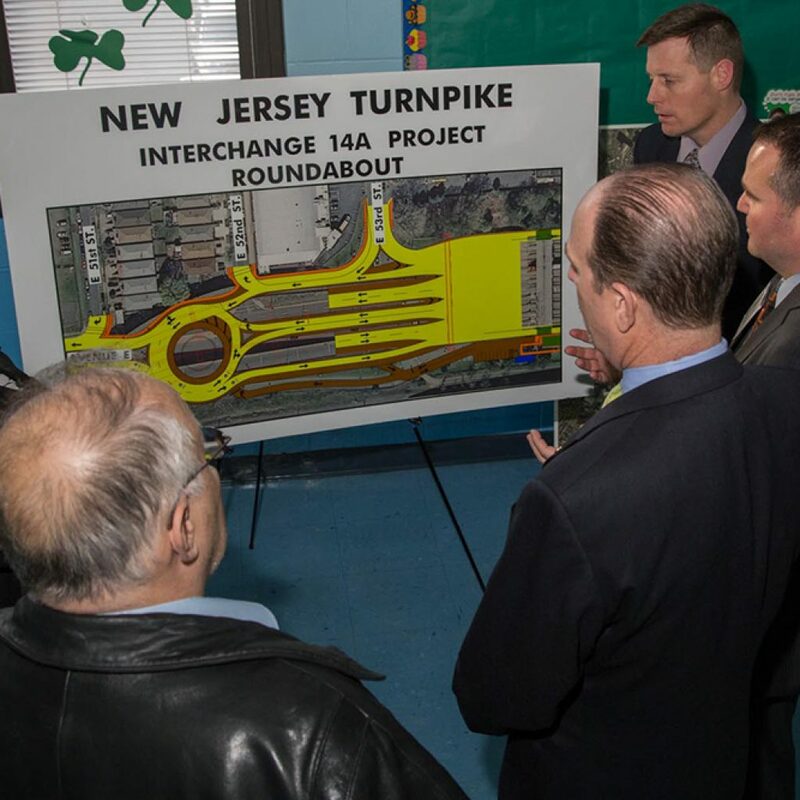 The New Jersey Turnpike Authority’s Interchange 14A Improvement Project in Bayonne and Jersey City finally reached completion, as planned, late last year, 2018. 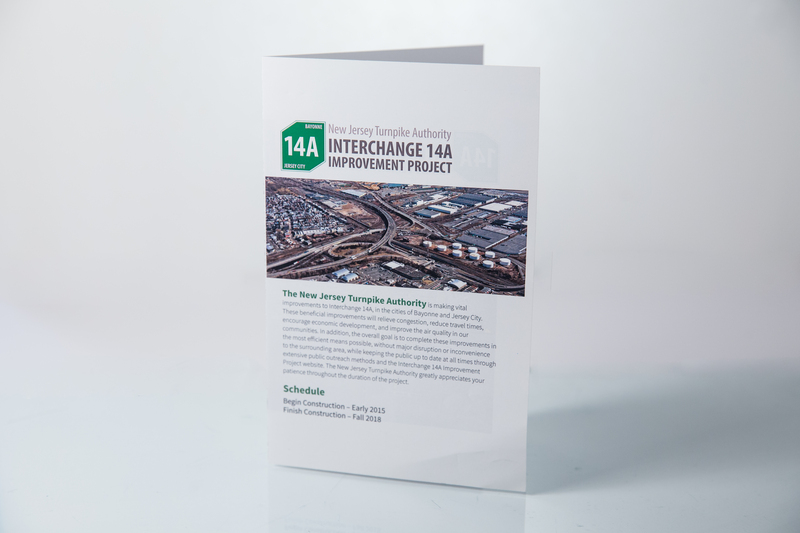 Vital improvements have been made to Interchange 14A; improvements that have reduced delays on the Newark Bay-Hudson County Extension, relieved congestion on city streets, created jobs, improved air quality and encouraged regional economic development. 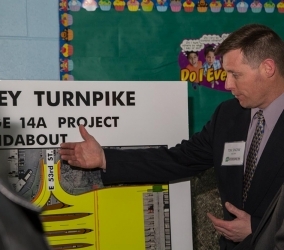 Funded by toll dollars, the project was designed to minimize disruptions in the community and to maximize community outreach. 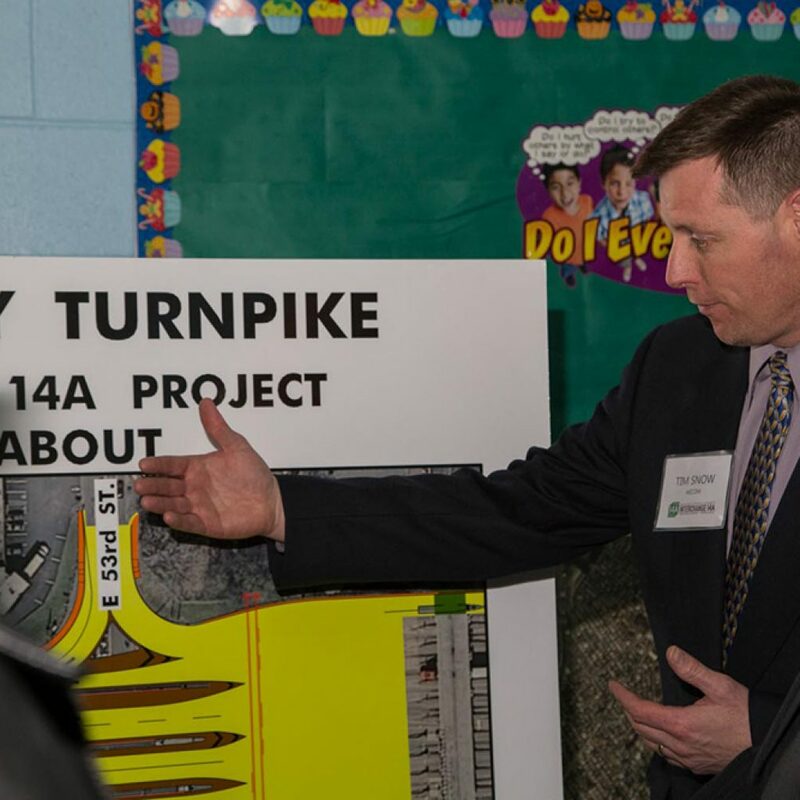 The project included expanding the toll plaza from 11 to 13 lanes and making several ramp and roadway improvements to alleviate congestion in the area. 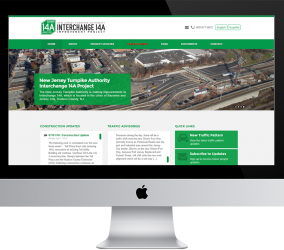 Stokes Creative Group, Inc. is pleased to have provided extensive public outreach support throughout the duration of the project, which included managing the project website; stakeholder database; communication tracking and toll-free public hotline; graphic design; and photography. 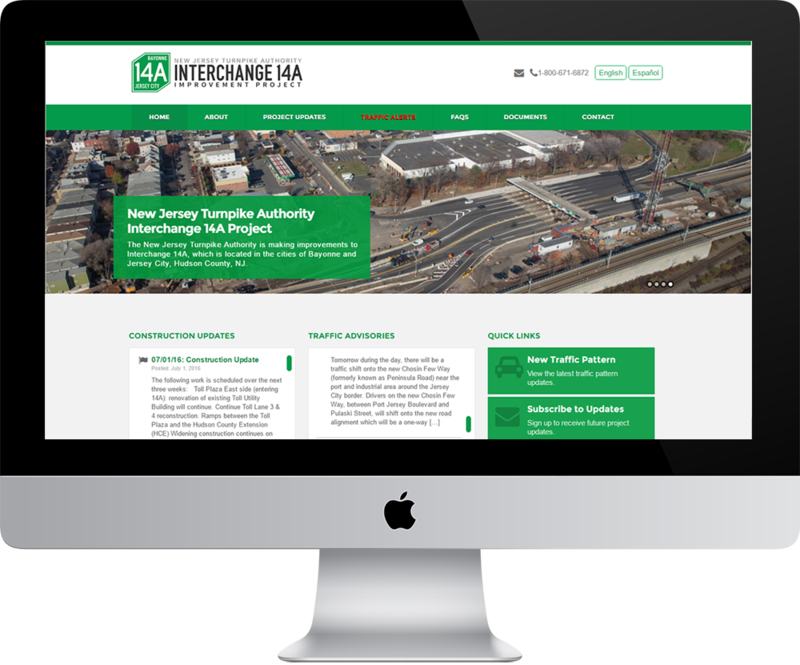 The Interchange 14A Improvement Project received a “Distinguished Engineering Award” from the New Jersey Alliance For Action in 2017 and a “Leading Infrastructure Project” Award in 2018. 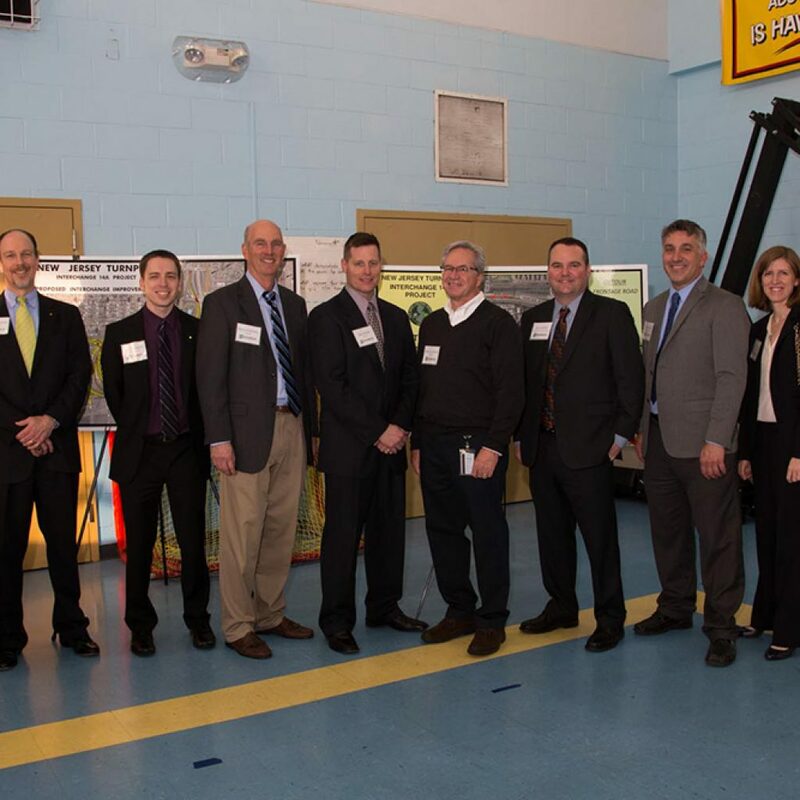 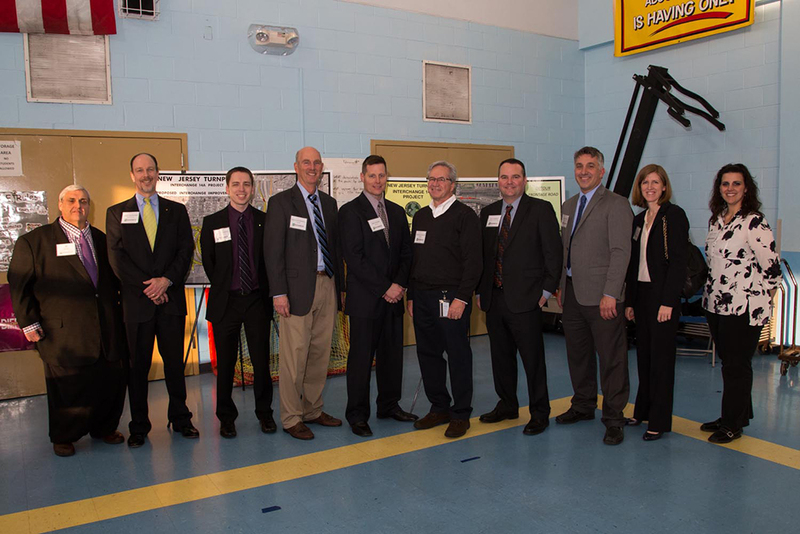 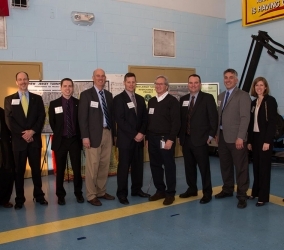 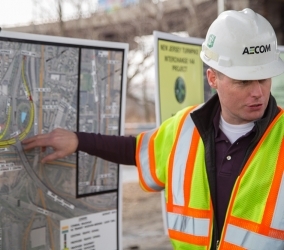 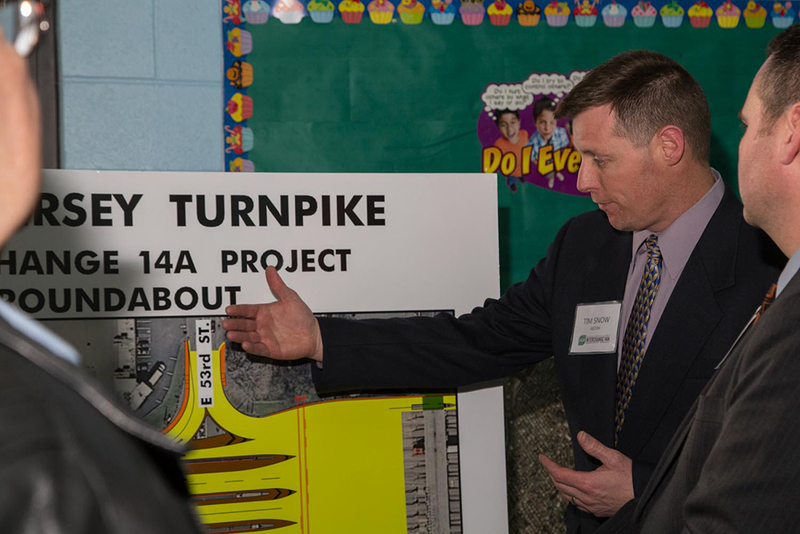 The Interchange 14A Improvement Project team is comprised of representatives from the New Jersey Turnpike Authority, AECOM, Gannett Fleming, Stokes Creative Group, Inc., and many other subsconsultants. 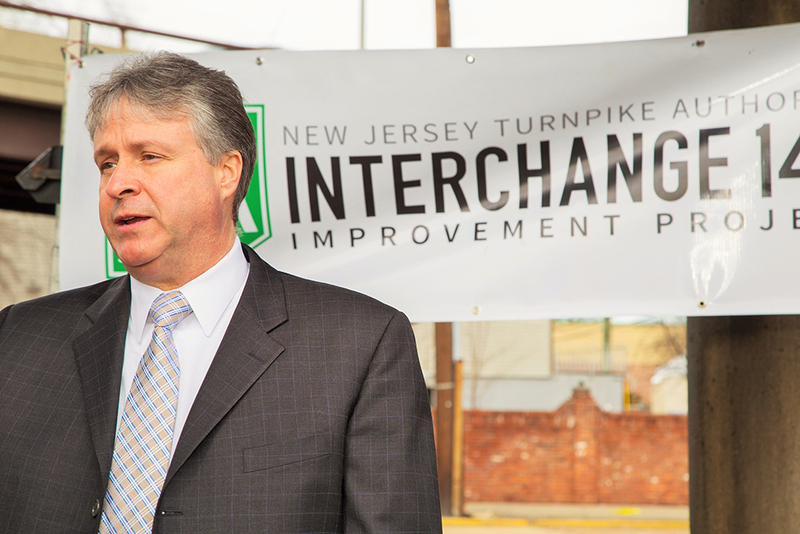 Tim Snow, P.E. 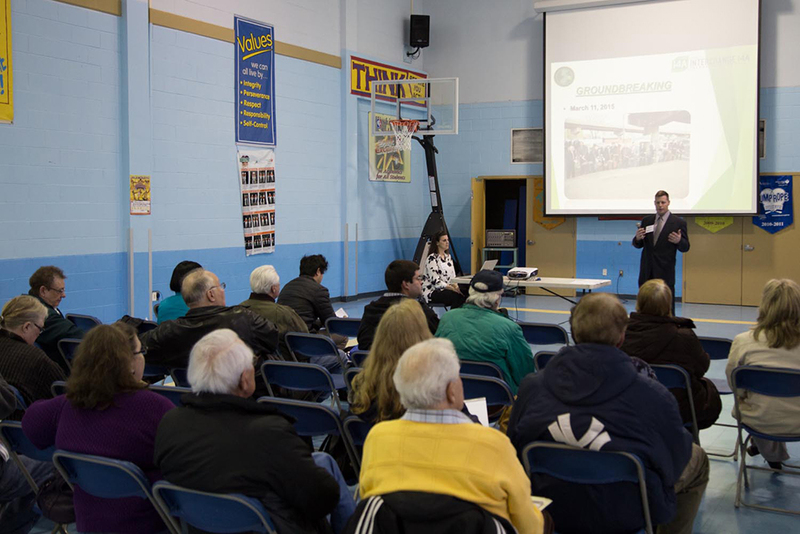 from AECOM answers questions about the Interchange 14A Improvement Project to residents who attended the final public information center. 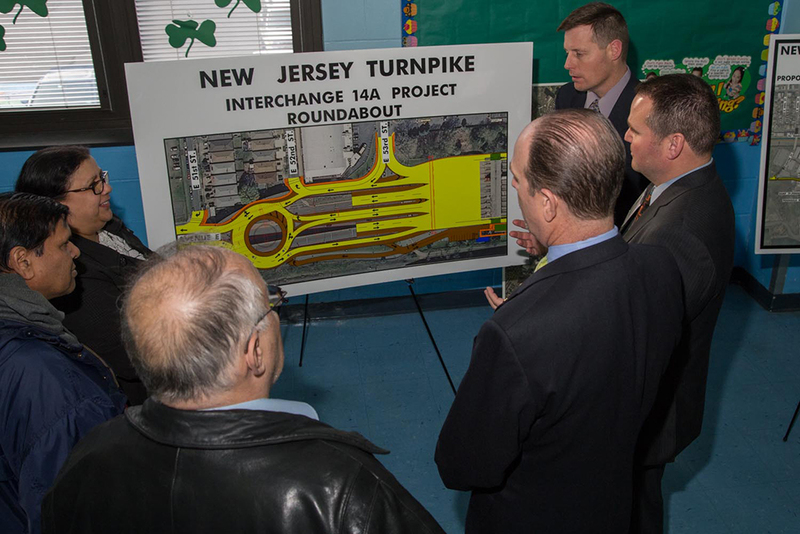 Residents gather around the project boards to hear about the upcoming construction for the Interchange 14A Improvement Project. 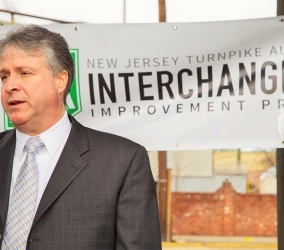 Tim Snow, P.E. 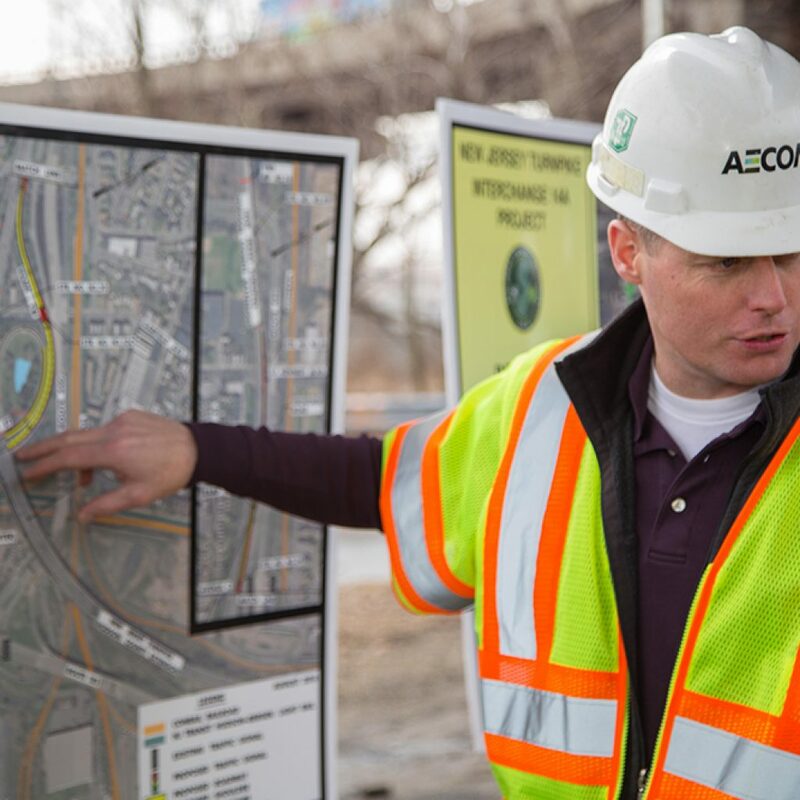 from AECOM explains the project details to attendees at the public information center just weeks before the groundbreaking ceremony for the Interchange 14A Improvement Project. 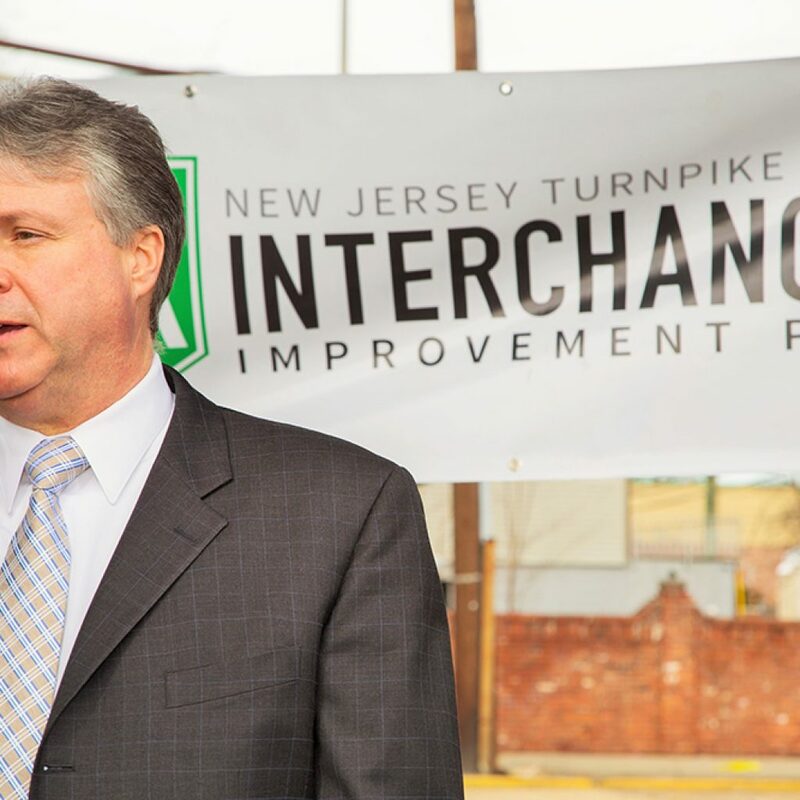 At the groundbreaking ceremony, Tim Snow, P.E. 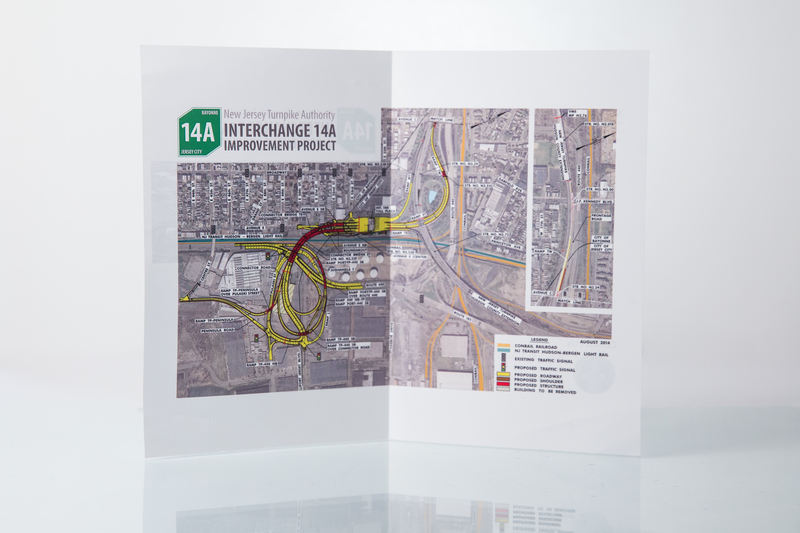 and other representatives field questions from the press and other government officials about the Interchange 14A Improvement Project details. 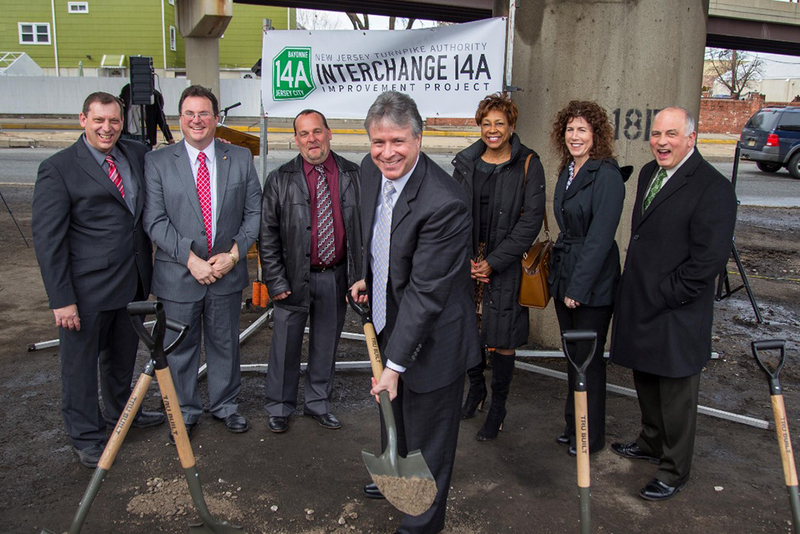 Bayonne Mayor Jimmy Davis expresses his excitement about the Interchange 14A Improvement Project at the groundbreaking ceremony. 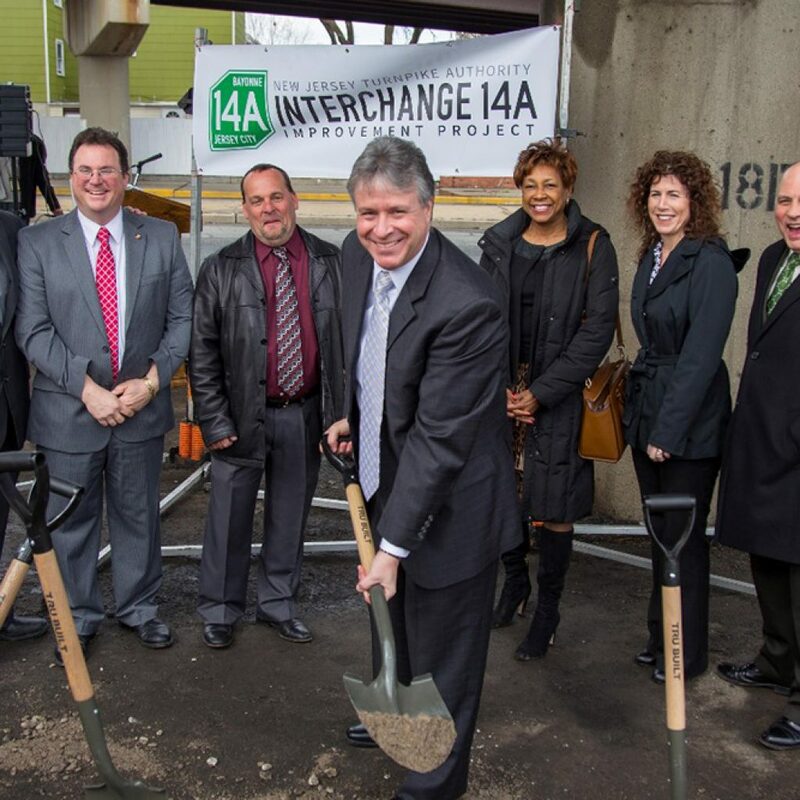 Bayonne Mayor Jimmy Davis proudly stands with his councilmen and councilwomen staff at the groundbreaking ceremony for the Interchange 14A Improvement Project. 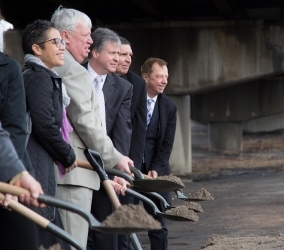 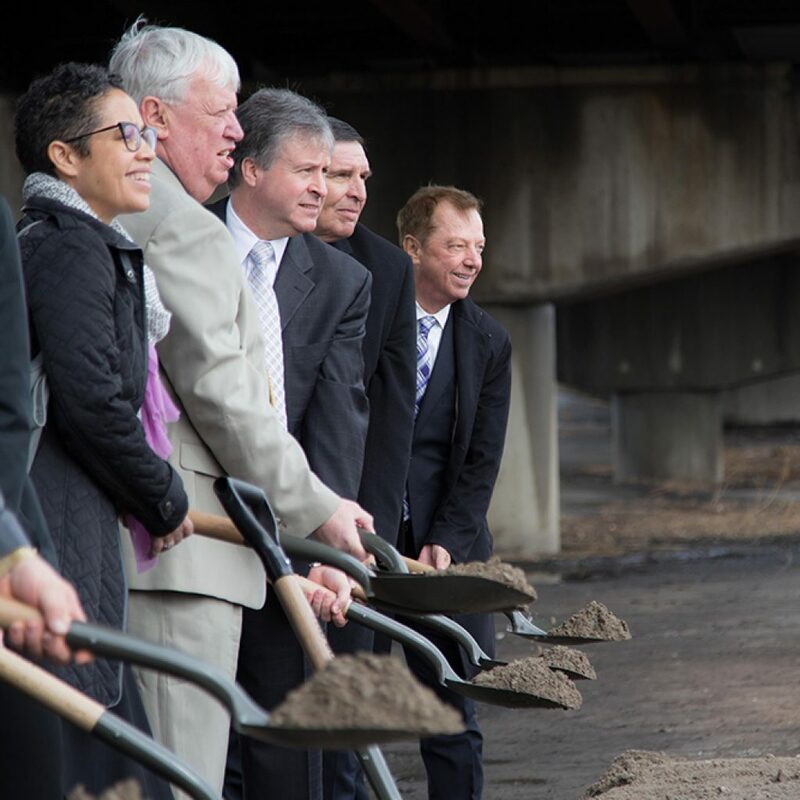 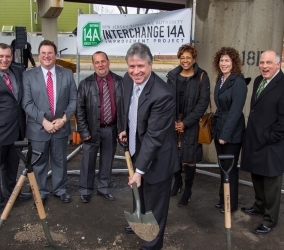 Many representatives from the county, state, Bayonne and Jersey City, and various agencies participated in the groundbreaking ceremony for the Interchange 14A Improvement Project. 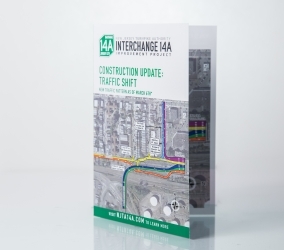 The Interchange 14A Improvement Project website, created and managed by Stokes, provides weekly construction updates and traffic alerts, maps, electronic pamphlets, important documents, and photos from the public information centers and groundbreaking ceremony. 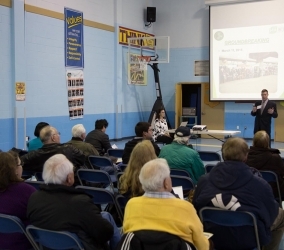 It is a comprehensive resource for the stakeholders within these two busy communities. 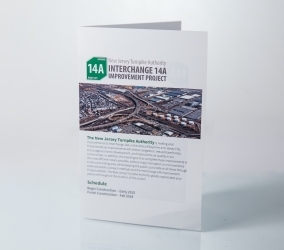 Construction update pamphlets regarding the New Jersey Turnpike Authority’s Interchange 14A Improvement Project were produced by Stokes to distribute around the construction location to residents and businesses. 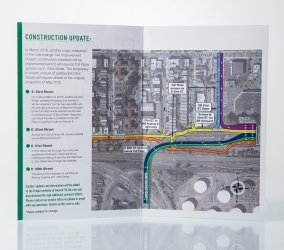 These pamphlets contained important updates with a detailed map of the new traffic patterns. 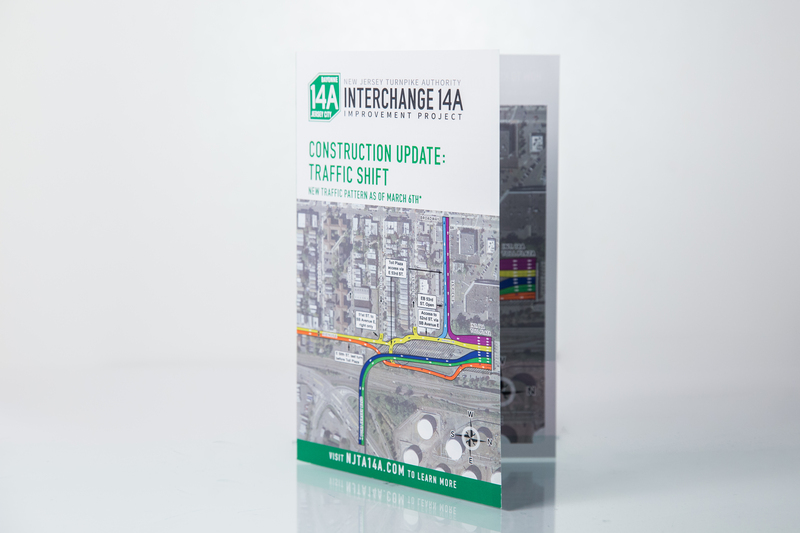 Inside the Interchange 14A Improvement Project construction update pamphlets, detailed information about the traffic patterns on the surrounding residential and business areas was clearly explained, as well as a color coded map of the 53rd Street vicinity. 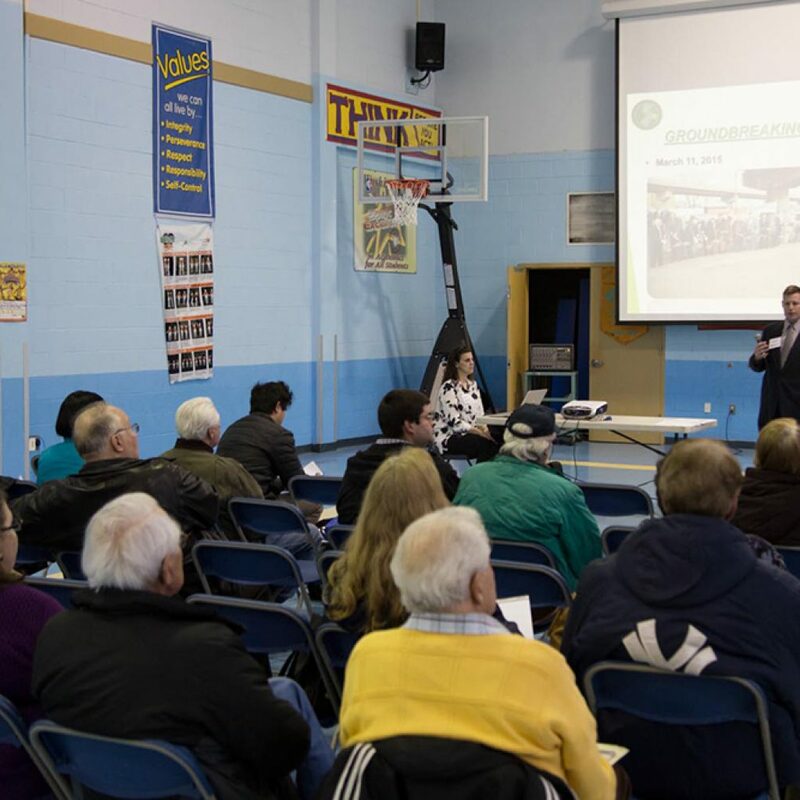 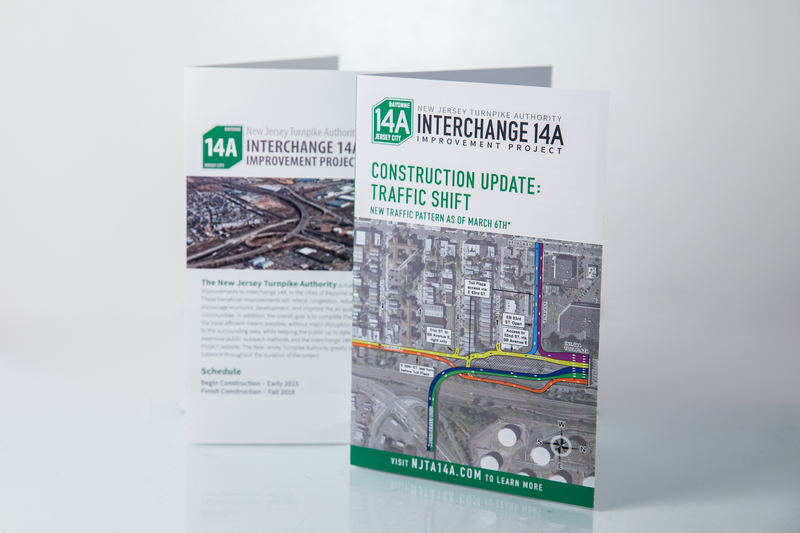 Prior to the start of the Interchange 14A Improvement Project, an informational pamphlet was created to distribute to city officials, local businesses, and residents surrounding the construction zone in Bayonne. 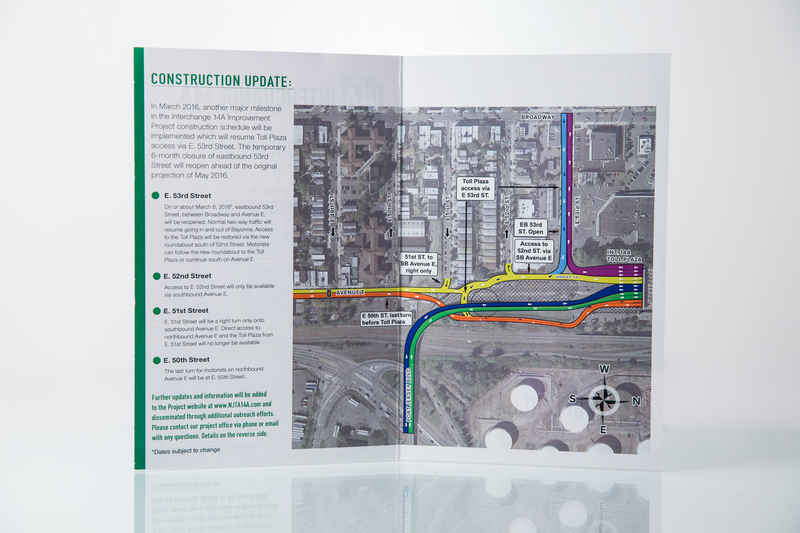 The pamphlet showed the large-scale construction effort, as well as the hotline, email, and website for contacting the outreach office for questions or concerns. 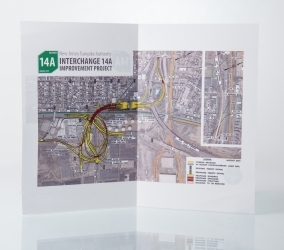 The map inside the pamphlet detailed the new ramps, roundabout, and roadways that seek to improve the current conditions at Interchange 14A. 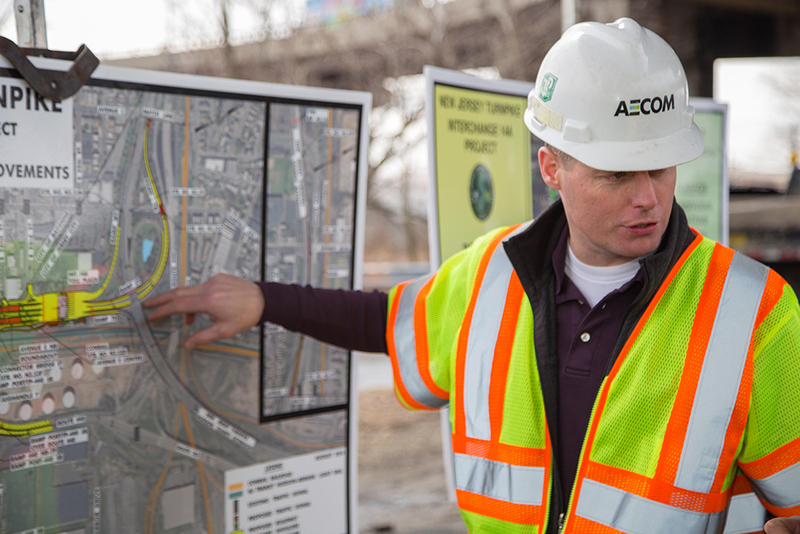 The construction zone borders both Bayonne and Jersey City’s industrial area. 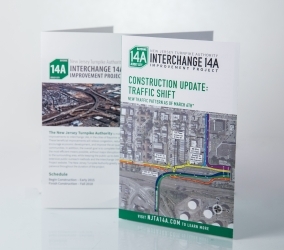 In addition to traffic updates and general informational pamphlets, Stokes produced several other outreach materials for the Interchange 14A Improvement Project including a bi-lingual shuttle bus pamphlet, memos for residents regarding temporary parking restrictions and minor disruptions to utilities, and the project website containing updates and information.